The thing I absolutely love about going home is the food. The south side of Chicago is home to some great restaurants and J’s parents love showing me all their favorite spots. 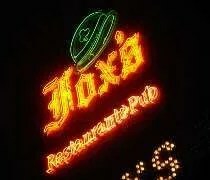 One of the places I heard them talk about quite a bit was Fox’s Restaurant & Pub, so I suggested going there for dinner. J’s mom had some coupons that were about to expire, so that’s what we decided on. 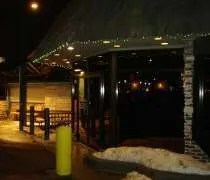 Fox’s Restaurant & Pub in Oak Lawn is on South Cicero and 92nd Street. There are four locations total in the Chicago area. Other restaurants are in Chicago, Orland Park, and Plainfield. J asked her mom if she should call and get reservation. The answer was no because Fox’s is huge. Fox’s looks like an Irish pub even thought it’s not the typical “we got our bar from Ireland and only serve Guiness” Irish pub. When you walk in, you’re met by a hostess who then takes you down a long hallway to the main dining room. There are also two other levels that host private parties and overflow dining on busy nights. They really squeeze people into the main dining room. There are booths that run all along the walls and then a number of tables set up just inches from each other in the remaining space. The chairs are a riot. I wish I had a picture because there is no way I could describe them. They look sort of like the chairs used at the kitchen table on “That 70’s Show.” They’re old, bucket seats that swivel, are on rollers, and covered in vinyl. I had to chuckle a bit when I sat down. The rest of the atmosphere sort of fits in with those chairs. It’s not campy, but it’s more of a sophisticated aging. They have live music now most nights of the week and he was loud. Very loud. I gave up trying to talk to anyone at my table. I even had a hard time communicating with J who was right next to me. Her step dad was trying to tell me a story and I was only picking up every third word or so. The menu was huge, but a little confusing. The way it was sectioned off took a while to figure out. I finally found the burgers in the back and that was all I needed. I ordered the BBQ Burger which pretty much what it sounds like. It was a 10 oz burger topped with cheddar cheese and bacon then smothered with Sweet Baby Ray’s BBQ sauce. The burger was perfectly cooked and really juicy. The juices and the BBQ sauce made the bun really soggy, so once I picked it up, I didn’t want to set it down. It was pretty good despite the challenge. I chose waffle fries as my side. They were good, but there wasn’t a whole lot there. J’s mom ordered the pulled pork sandwich which was the special. My rule is if they don’t have BBQ on the menu everyday, don’t order it. When the waitress set the plate down in front of her, she tried to pass it to J thinking it was her chicken. It was the processed pureed pork that you get out of a can and not a true, smoked pulled pork sandwich. She ate about half then boxed up the rest to take home. Her side was baked beans. J’s step-dad ordered the Turkey Club. He didn’t say anything about it that I could hear, but polished off the whole sandwich. Dessert was tempting again. There was a sign on the table for a triple chocolate cheesecake which is what J and I got to split. Her parents got a slice of apple pie. The cheesecake was delicious. We didn’t have a problem finishing it off. Our bill for dinner and four drinks was just over $71. I know when the four of us have gone out in the past, we have pushed closer to a hundred, so seventy bucks for a good meal isn’t bad at all. Fox’s was good. It’s not quite the best place they’ve taken me, but it was really good pub food. The incredibly loud live music was a little bit of a turn off since we couldn’t have a conversation, but other than that, I don’t have a negative thing to say about the place.